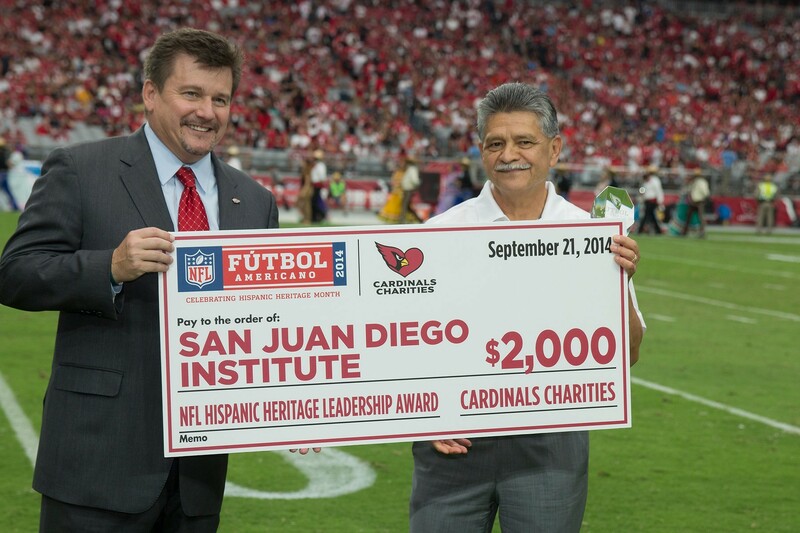 Phoenix, AZ – Latino activist and leader, Tommy Espinoza, President and CEO of Raza Development Fund (RDF), received a 2,000 dollar check for his favorite charity organization from Michael Bidwell, owner of the Arizona Cardinals. The money donation, going to local non-profit San Juan Diego Institute, was part of the Hispanic Heritage award Espinoza received on Sunday the 21st during the game between the Cardinals and the San Francisco 49rs. Photo: Phil Soto, MixedVoces photographer.